T.S. Klugh Studio™ offers many services in recording and production. Our prices are presented in the table below so that you can plan out your project with our studio. IMPORTANT: For hourly fees, all partial hours are charged as a full hour. I want to make a studio recording. I want to make a re-mix of an existing mix or recording. I want to make a re-master of an existing mix or recording. I want to convert a record, tape or other type of media recording to compact disc. I want to convert a record, tape or other type of media recording to digital files. I want the studio to compose music for me. I want the studio to arrange music for me. I want the studio to create original sound effects for me. I want to edit existing music. I want to edit existing sound effects. I want the studio to design a DVD insert, spine and/or label for me. I want the studio to convert my sound files from one format to another. I want the studio to design a CD insert, spine and/or label for me. I want to consult with the studio for information. I want the studio to help me prepare an event. I want the studio to help me organize an event. I want the studio to provide me with conductor services for an event. I want the studio to provide me with vocalist services for an event. I want the studio to provide me with instrumental musician services for an event. I want the studio to make a web site for me. I want voice lessons from the studio. 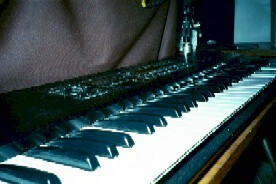 I want keyboard lessons from the studio. I want piano lessons from the studio. I want music composition lessons from the studio. HOUR. ALL PARTIAL HOURS ARE CHARGED AS A FULL HOUR. (OR SOUND EFFECTS) ARE SPECIFICALLY MADE-FOR-HIRE. THE MEDIA COVER DESIGN PROCESS. FOR THE HOUR. ALL PARTIAL HOURS ARE CHARGED AS A FULL HOUR. T.S. KLUGH STUDIO™ BUT THROUGH THE CREATIONS OF TIMOTHY S. KLUGH™. CLIENT RETAINS RIGHTS TO THE INFORMATION ON THEIR ARTIST WEB SITE. BEEN USED IN THE CREATION OF THE WEB SITE. THESE FEES REFER TO VOICE LESSON WORK THAT IS DONE FOR A CLIENT. VOICE LESSONS NORMALLY TAKE PLACE ONCE A WEEK OR AS REQUESTED. VOICE LESSONS ARE A HALF-HOUR IN LENGTH. AS REQUESTED. KEYBOARD LESSONS ARE A HALF-HOUR IN LENGTH. THESE FEES REFER TO PIANO LESSON WORK THAT IS DONE FOR A CLIENT. PIANO LESSONS ARE A HALF-HOUR IN LENGTH. ARE A HALF-HOUR IN LENGTH. CHARGED AS A FULL HOUR.